Bowhunting in Europe is growing and it is not uncommon to see photos of European archers with their trophies. Animals such as red deers, roes, fallow deers, wild boars and even the most difficult and emblematic species such as chamois or ibex are routinely hunted by bowhunters of the old continent. While the vast majority use compound bows, the number of hunters who choose traditional bows, is growing and the traditional bowhunting community is stronger each day. 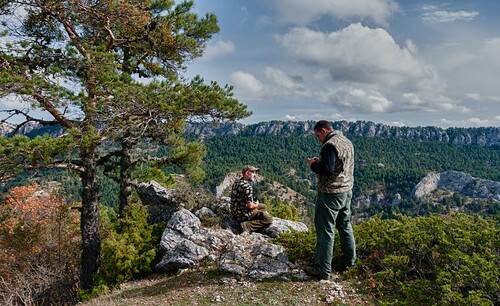 In Spain we are fortunate to be able to practice this ancient form of hunting in many places and among those who know , my favorite is the land managed by Juancho and Pablo, my friends running a place called Sierra de la Madera. 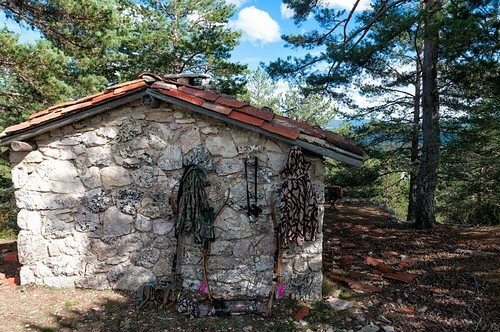 Their two properties, one around 1,700 has and the other more than 5,000 has, are near the city of Cuenca, close to Madrid. Recently, in company of my brother Alberto and my friend, Aitor, we have been enjoying a few days bowhunting with our recurves in the way that we like , with our backpacks and sleeping in the field , in our tents. The truth is that the sensations experienced when hunting in this way are very uniques and to the romance of sleeping in the field joins the advantage to wake up and hunt as soon as you like as the animals are within walking distance, reducing travels, noises and car movement. For our memory will be the thunderstorm at night with its thunders and rays illuminating the interior of our tents and with a heavy rain that made ​​ it impossible to sleep thinking that all would fly at any time. The camp place was in the highest peak, more than 1.700 meters. 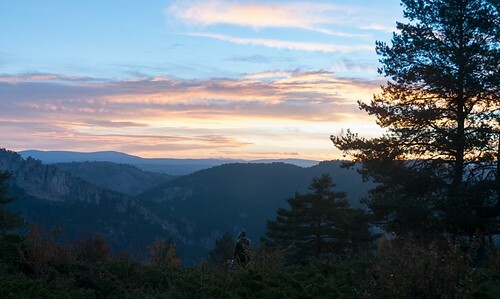 The land, large mid-mountain forests with greater height around 1700 meters, is home to red deers, very large males, fallow deers,(great densities and big males), wild boars and even some spanish Ibex. Locating the animals is not easy because the terrain is very large and provides much protection. Anyway, to see dozens of animals in a day is not uncommon, but approach within shooting distance is not easy as these are wild animals. Anyway, we had a real chance of shooting and personally, I missed a doe less than 30 meters in a difficult shot, kneeling and from a small mound. Anyway, an amazing experience to remember, which we will repeat, as hunting in these areas, with our backpacks and sleeping in tents, feeling a total freedom, is something that to this day, in Europe, is a privilege.